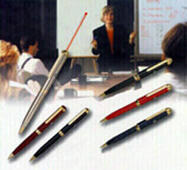 Featuring a laser pointer and ballpoint pen in a single unit, the Point & Write Series is available in two distinctive styles. Pen refills are available at office supply stores worldwide. Note: Laser beam depicts red spot reference point and is not visible. See Laser FAQ's for additional information about all Aegis laser products. The wide models are available with black, blue, and red enamel finishes. The slim models are available with black enamel, red rubber, silver plated, dark gray polyester and black rubber finishes. All finishes are extremely durable and applied over metal barrels. Laser pointer and ballpoint pen in the same product. Fully collimated lens amplifies beam visibility and range. Recessed laser assemblies prevent damage when pointer is dropped. High quality finishes remain attractive, even with continuous use. Close tolerance rubber switch prevents dust and moisture from entering the barrel.